Do you know what the name for a sequence of typographical symbols used to represent a non-specific, profane word or phrase? That’s right, there’s a name for this: #@$?%*! and it’s called a grawlix. 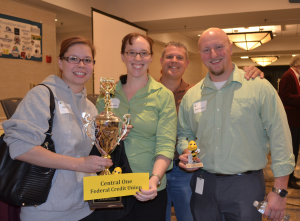 If you knew that, perhaps next year you should join one of the 108 people who make up the 36 teams to compete in the Ed Foundation’s annual Trivia Bee. The Westborough Education Foundation pulled off another great evening of fun for the whole family on Monday evening, November 2nd! This is the foundation’s largest fundraiser of the year, enabling that organization to fund teacher grants for the 2015-2016 school year in excess of $24,000! 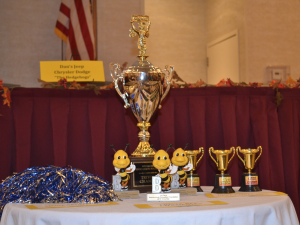 Below we have pictures of the winning team from Central One Federal Credit Union, along with our esteemed judges for the evening, former School Superintendent Marianne O’Connor, Police Chief Al Gordon, and Library Director Maureen Ambrosino. The Westborough Education Foundation is a private non-profit organization dedicated to providing financial support for projects and programs that expand educational opportunities, foster and stimulate creativity, and enhance the excellence of academic experiences for Westborough students. In addition, its purpose is to establish a permanent fund to support grant awards for innovative initiatives that are above and beyond the base curriculum requirements and are outside the scope of the Westborough School Department’s budget. 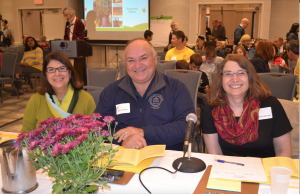 Don’t worry – if you missed this year’s event, or if you were on a team and you just want to re-watch and hear the questions that stumped you, Westborough TV recorded the entire event and it will be available for viewing soon.